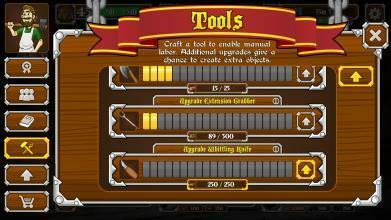 Expand your workshop as you hire Workers, increase their Training and upgrade Tools. Gather materials and craft objects. 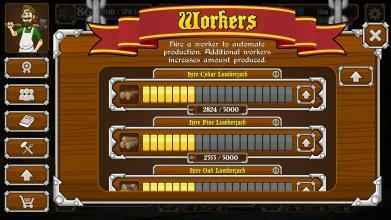 Upgrades Workers - Automate production and increase amount production. Training - Earn exp and decrease crafting time. 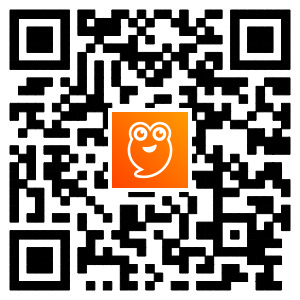 Tools - Tap objects to speed production. Increases chance to produce extra. Equipment - Automatically tap objects over time. Additional features Achievements - Complete achievements to earn premium currency. Talents - Earn exp to level up your profession and unlock powerful upgrades. Prestige - Restart your profession to earn bonus exp and keep all unlocked talents. 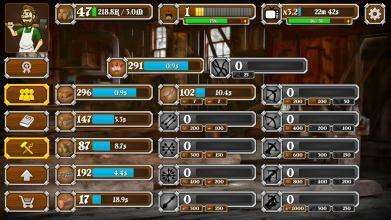 Workshop - Contribute additional materials and objects to upgrade the workshop, increasing the max stash size. Expertise - Improve your stats the more you complete a task. 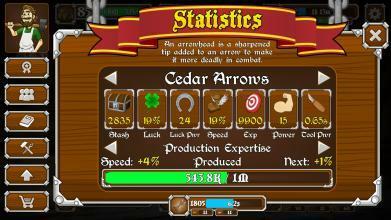 Professions Woodworking - Gather wood to craft arrows and bows. Blacksmithing - Coming soon! Gemcrafting - Coming soon!